The King Avenue Mall ... Mabani Steel to supply the steel structure. The company is a major supplier of structural steel buildings under the Al Rajhi Building Solutions Group, one of the Middle East’s premier construction companies. Under the terms of the deal, the company will design, supply and install the steel structure for the new mall, which is being positioned as one of the biggest malls in Saudi Arabia and also the GCC region upon its completion in December 2020. The scope of work includes developing the key interior and exterior steel sections of the mall, including more than 13,000 tonnes of main structural components. Design for the steel structures was expected to be completed last month (January), while fabrication is planned for completion in May. The installation at the work site is likely to be done by October as per the approved schedule and plan. 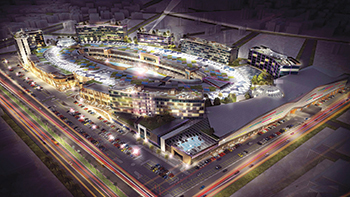 The mall, which occupies a 125,000-sq-m area, will house youth and family hubs, hotels, a central plaza, entertainment areas, food courts and large retail outlets showcasing global brands. The overal structure of the mall is elliptical in shape, giving the building a majestic appearance. “This win reflects the continued confidence in the company as a world-class provider of steel construction solutions that range from detailing to on-site erection along with maintenance and after-sales services,” he stated. Adnan Deeb, the operations manager, Umm Al Qura and Al Nahla for Investment, said: “We have awarded the scope of supplying and erecting the steel structures for the King Avenue Mall project to Mabani Steel. We are confident that they will complete the task as per the schedule. “This new partnership signals the start of a longer business relationship – aiming to work together in other projects in Saudi Arabia that are aligned with the kingdom’s Vision 2030 to strength the economy, while creating job opportunities for Saudi youth,” he added.